Podcast 561-Pacific Coast Highway. People have been asking for some ‘travel log’ podcasts from the Great Northwest Road Trip 2016 series, so in Podcast 561-Pacific Coast Highway, some travel log audio from Oregon’s coast during a storm, again the angry surf along the Pacific Coast Highway in California north of San Francisco. Most travel sites write about the Pacific Coast Highway south of San Francisco. On this trip I have driven Route 1, all the way from just south of Seattle, through San Francisco to Los Angeles right along the coast. What a long strange trip it’s been. Winding roads, crazy storms, spell binding coastal maritime towns and villages and breathtaking vistas coming down out of mountains. There aren’t enough superlatives to describe the experience of twisting and turning two lane roads in 16 year old Mobile Podcast Command laboring up and down, sometimes in brilliant sun and sometimes in the midst of fog, or heavy wind and rain, all under a full moon during these few days in the middle of October 2016. The biggest challenge has been getting out from under a series of storms that have pounded the west coast, from Seattle to San Francisco. 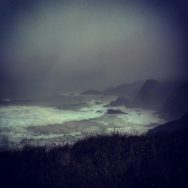 In podcast 561 you’ll hear the wind and rain in Oregon, the surf in Northern California, and a little surprise at the end of the podcast for you midwesterners. I have often said long trips take on a personality of their own and you end up having to just go with the flow. Travelers who try to stick to a schedule, try to see too many things or get frustrated with the ‘trip’ are not good travelers. After thousands of miles through the mountains, plains and coastlines of the United States, I’ve learned to settle in for these long trips and just enjoy whatever goes down. This trip, the heavy rain and fog has been following me all down the coast, which has made it even more of an adventure. From pulling into state parks and RV-Parks in the middle of the night and hooking up to electric, to driving 8 to 15 hours at a time on the PCH, it’s been really fun and educational. If you’re looking for those romantic seaside towns tucked away along rocky coastlines, this is the place. There’s the reason they say ‘The West Is The Best’. Sponsored by Hydrus Performance.